Sabarmati Ashram (also known as Gandhi Ashram, Harijan Ashram, or Satyagraha Ashram) is located in the Ahmedabad suburb of Sabarmati adjoining to famous Ashram Road, at the bank of River Sabarmati, 4 miles away from the city Town Hall. This was one of the residences of Mohandas Karamchand Gandhi. This ashram is now a national monument by the Government of India due to its significance in the Indian independence movement in the form of the Dandi March in 1930. Sabarmati Ashram, formerly known as "Satyagraha Ashram", situated in Ahmedabad at the Kocharab Bungalow of Jivanlal Desai, a barrister. Later on it was shifted to the banks of Sabarmati river and then it came to be known as 'Sabarmati Ashram'. Gandhi stayed at the Ashram from 1915 to 1933 later on the Ashram was disbanded. The Ashram is a witness to many important historical events. 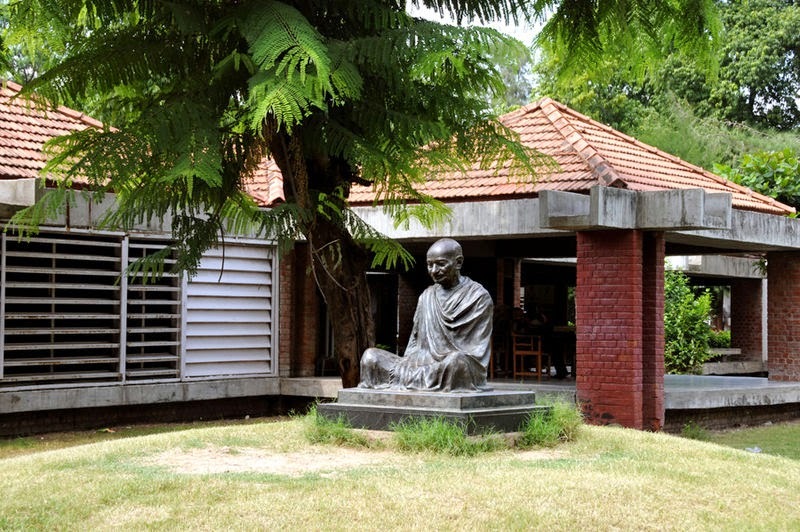 While at the Ashram, Gandhi formed a tertiary school that mainly focused on manual labour, agriculture, and literacy to advance his efforts for nation's self-sufficiency. It was also from here on the 12 March 1930 that Gandhi marched towards Dandi, 241 miles from the Ashram with 78 companions in protest of the British Salt Law, which taxed Indian salt in an effort to promote sales of British salt in India. This mass awakening filled the British jails with 60 000 freedom fighters. Later the government seized their property, Gandhi, in sympathy with them, responded by asking the Government to forfeit the Ashram. Then Government, however, did not oblige. He had by now already decided on 22 July 1933 to disband the Ashram, which later became asserted place after the detention of many freedom fighters, and then some local citizens decided to preserve it. On 12 March 1930 he vowed that he would not return to the Ashram until India won independence. Although this was won on 15 August 1947, when India was declared a free nation, Gandhi was assassinated in January 1948. The museum houses eight life-sized colour oil- paintings and an exhibition on Gandhiji's life 'My life is My Message' and 'Gandhiji in Ahmedabad'. An archive has also been set up. It stores 34,066 letters by Gandhiji, manuscripts of his 8,633 articles, negatives of 6,367 photographs, 134 reels of microfilms of his writings, 210 films on Gandhiji and the freedom struggle. The library has over 30,000 books, 155 letters of felicitation received by Gandhiji, besides a miscellaneous memorabilia comprising of coins, postal stamps and the like. The museum measuring 24,000 sq. feet in area has besides 54 blocks of 20'x20' each, a conference hall and an auditorium for watching films and video.